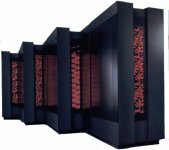 This is a massively parallel supercomputer using hundreds of Sparc processors. The Connection Machine acts as the Park's Central Computer. The system has to be rebooted before that Park's security systems and phones will work. The lights flash just like they do normally, although it's hard to understand why a theme park needs a supercomputer..